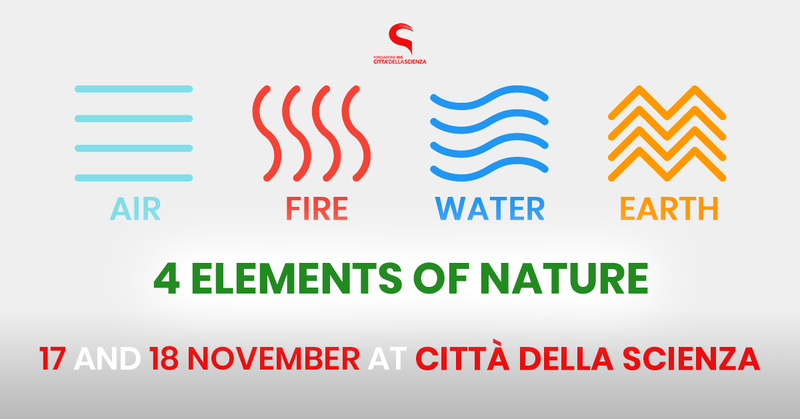 The “Theory of the 4 elements of Nature” (Air, Fire, Earth, Water) traces its origins back to ancient time that is to the ancient Greek philosophers, is found in all cultures from Judaism, Christianity, Buddhism and Eastern cultures. Primitive beings considered the Sun and the Earth of deities and knew the spirits of Air and Water. Thanks to the progress of knowledge, today we are able to understand and explain these elements that surround us with a rational and scientific mind. We will do it in Città della Scienza thanks to special experiments that will make you penetrate mysteries of the matter. Little scientists grow up! “Air, Fire, Earth, Water” is the most fun and addictive Science Show you can imagine! A scientific communicator will bring you into a succession of experiments, to be reproduced even at home, because science does not need precious materials, but expresses itself everywhere around us, in the eyes of those who can interpret it. During this weekend here will be many moments of scientific study insights! Starting on Saturday 17th with the element “Water” in “Sinks or Floats?” To discover the laws that regulate the floatation (or sinking) of the bodies. Why does a body float and one sink? Try to guess what will be the fate of an object in the water and verify it! “Air” element, a gaseous envelope to which we owe our life, will star with “Fly as high as you can …” a workshop dedicated to kites. The feeling that comes from seeing them fly one you did with your hands is priceless. Together with your parents, build and fly your personalized kite and discover the science behind this extraordinary object! Do not miss the comparison activity “Aria VS. Water” where, talking about air and playing with water, we will investigate some fluid behaviors through the realization of different experiments. Simple explorations that will allow us to better understand that air, although it is normally invisible and appears elusive, is matter … sometimes stronger than water! On Sunday we will focus on the other two remaining elements: Fire and Earth, inextricably linked to each other. “It is not the Earth belonging to Man, but it is the Man belonging to Earth” … When we think of Fire, one of the first images that are formed in our minds is a river of red, hot, incandescent lava that flows from the mouth of volcanic crater. Have you ever stopped to think about the “language” of volcanoes? The volcanoes speak to us and communicate. They produce signals that we detect and record with different techniques. It is up to us to understand them to know the structure, their behavior and the danger. Are you ready, then, at an explosive laboratory? “Volcanic…experiences” will allow you to make the model of a real volcano and cause the explosion! But be careful not to get too dirty! Finally, the element of the Earth, solid, lush, but sometimes even unstable! Deepen the “vibrations you do not expect” to explore the vibrations of the ground, even those not immediately perceptible, thanks to the use of the seismometer instrument. A new workshop space, the “Children Workshop” has been opened in Città della Scienza. It seems like a complex name, but identifies a welcoming and comfortable place where our younger visitors, from 3 years upwards, can find a child-friendly space, with tables and seats, where they let their imagination flow, and with some exhibits such as “Mirrors” and “Two in one” to accompany them, hand in hand, and step by step, in the world of science. On Sunday there will be the “animated readings” – inspired by the words of a fairy tale animated by a storyteller, children will be able to create a personalized design! Fantasy has no age! “Researcher Craft”: How to participate in a research project? What is CHILD ROLE? How children are able to influence the choices made by parents, especially in the field of nutrition? And how do parents let themselves be influenced by the presence of children in their choices? We will understand this by participating in this survey and as a tribute for the participants, a tasty snack! We were looking forward to the return of the most beloved workshop for all children, the “Nintendo Labo”! By integrating the new technologies with a good dexterity, discover with your parents “Nintendo Labo”: turn a simple piece of cardboard into something different, a motorbike, a fishing rod, a plane or whatever comes to mind! Then, add a Nintendo Switch console to bring them to life and enjoyment is guaranteed! Win a race, catch a fish, play a keyboard … With Nintendo Labo, everyone can experience the joy of building, playing and discovering. Have fun by creating your items: you could even invent new ways to play with Toy-Con! Try the new Toy Con set dedicated to vehicles and discover the driver who is in you! After the great success of the preview, Sunday is on the planetarium “Far Worlds: The Search for Extrasolar Planets”: In recent years the search for planets that orbit around stars other than our Sun has had an unprecedented surge. Today we know that planetary systems similar to ours are the norm rather than the exception, and the study of extrasolar planets has become the main way to try to answer a fundamental question: does extraterrestrial life exist? In this show we will discover the latest developments and future perspectives of the incredible hunt for the secrets of these distant worlds. You still have not visited the Corporea Museum? It is the only one in Italy, entirely dedicated to the “perfect” machine of the human body! A guided tour, in the company of one of our guides, will allow you to discover the secrets of our body and experience the exhibits that most intrigue you! Discover which fish, molluscs and crustaceans live in the pools of the “Sea “ exhibition? Follow the guided tour “Marine Ecosystems” and you will have the chance to caress some living marine organisms in our Touch pool. And if your children still want to learn, “Create your marine animals”, a laboratory where they can color fish shapes, inventing new species to populate our large virtual aquarium . A guided tour of the “Bugs & CO” exhibition is unmissable, the new exhibition space dedicated to the spectacular world of insects and more. For every man on Earth there are over 150 million insects. “The six-legged giants” have conquered almost all the habitats of our planet … it’s time to start getting to know them better. From October 10th to January 6th 2019, the Science Center’s exhibition areas offer is enriched with a new and technological exhibition “The Beauty of Imaging”, organized by the Bracco Group. The exhibition celebrates the beauty “from within” the human body: an exploration made possible thanks to diagnostic imaging: one of the ten most important discoveries in the entire history of medicine. Today the journey in the body is accomplished hundreds of thousands of times a day, in every part of the world, in order to prevent and cure. And so, traveling within the human body, we discover the extraordinary complexity of the mechanisms that regulate it, the fascinating perfection of the structures that govern it and the general harmony of its functioning. The exhibition is a focus that simplifies and disseminates, investigating physics, chemistry, biology, applications and implications of X-rays / CT, Magnetic Resonance, Ultrasound and Nuclear Medicine. Water, air, fire and earth: can they have a connection to diagnostic imaging? Find out in “The Four Elements of Imagination”! A special Live Show in our Planetarium is on program Among astronomers, stars and galaxies, an astronomer expert will tell the public, in real time, all that is shown on the dome of the Planetarium, to offer a unique experience of immersion in the depths of our universe. By integrating within it the databases of the main international space agencies, a real journey in space. “Life and Death of a Star” will allow you to retrace all the stages of the life of a star, from birth to death. What are you waiting for? In addition, the 2D shows “From Earth to the Universe – From Earth to the Universe” will be at your disposal to discover the most important theories elaborated by man over the course of time in astronomy up to future prospects and, if you can not give up thrill of 3D, the “Robot Explorers” show to travel with probes, landers and orbiters in our solar system. Choices able to satisfy all tastes and needs!